For other uses, see Glenelg (disambiguation). 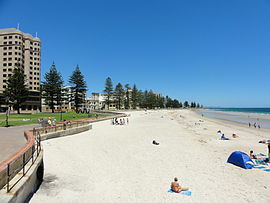 Glenelg is a beach-side suburb of the South Australian capital of Adelaide. Located on the shore of Holdfast Bay in Gulf St Vincent, it has become a tourist destination due to its beach and many attractions, home to several hotels and dozens of restaurants. Glenelg also became infamous for being the site of the Beaumont children disappearance in 1966. Established in 1836, it is the oldest European settlement on mainland South Australia. It was named after Lord Glenelg, a member of British Cabinet and Secretary of State for War and the Colonies. Through Lord Glenelg the name derives from Glenelg, Highland, Scotland. In Scottish Gaelic the name is Gleann Eilg. The name Glenelg is noteworthy for being a palindrome. Prior to the 1836 European settlement of South Australia, Glenelg and the rest of the Adelaide Plains was home to the Kaurna group of Indigenous Australians. They knew the area as "Pattawilya" and the local river as "Pattawilyangga", now named the Patawalonga River. Evidence has shown that at least two smallpox epidemics had killed the majority of the Kaurna population prior to 1836. The disease appeared to have come down the River Murray from New South Wales. The first British settlers set sail for South Australia in 1836. Several locations for the settlement were considered, including Kangaroo Island, Port Lincoln and Encounter Bay. The Adelaide plains were chosen by Colonel William Light, and Governor John Hindmarsh proclaimed the province of South Australia at the site of The Old Gum Tree in Glenelg North on 28 December 1836. The first post office in Glenelg opened on 5 December 1849; the first postmaster was John McDonald of the St Leonard's Inn. A telegraph office was opened in September 1859 and the two offices amalgamated in 1868. The present post office building on Moseley Square was built in 1912. The sale of the surveyed lots that constitute the Town of Glenelg was remarkable: the right to purchase, at ₤1 per "town acre", was allocated by means of a ballot held in February 1839. The "winner" was a syndicate of six led by William Finke, with Osmond Gilles, his nephew John Jackson Oakden and H. R. Wigley (father of W. R. Wigley) notable members. Among the town's earliest public buildings were the Independent (Congregational) church, opened 7 March 1848, St Peter's (Anglican) church, opened 28 March 1852 and the Pier Hotel, opened Christmas Day 1856, all the work of Henry J. Moseley, for whom Moseley Street and Moseley Square were named. No trace of the original structures remains. 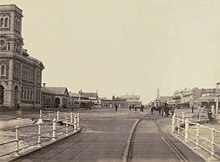 The Corporate Town of Glenelg was proclaimed in 1855, separating local governance of the township of Glenelg from that of the West Torrens and Brighton district councils. Construction of the Glenelg Institute, which is now the Glenelg Town Hall (pictured top right), started in 1875. The institute opened in 1877, with lecture rooms, a concert hall and a library. The classical structure was designed by Edmund Wright, whose works include the Adelaide Town Hall and Adelaide General Post Office on King William Street. The hall sits on Moseley Square, just off the beach. The Holdfast Bay city council acquired the hall in 1887. Today it houses a museum, tourist information centre and restaurants. In August 1857, construction of Glenelg's first jetty commenced; it was opened on 25 April 1859. 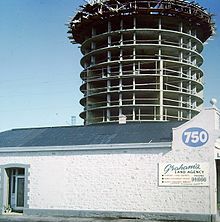 Costing over £31,000 (pounds sterling) to build, the structure was 381 metres (1,250 ft) long. The jetty was used not only by fishermen but also to accept cargo from ships, including a mail service operated by P&O, until Port Adelaide replaced it as Adelaide's main port. Passengers were also able travel from the Glenelg jetty to Kangaroo Island by steamer. Several additions to the jetty were made. A lighthouse was built in 1872 at the jetty's end, but a year later it caught fire and was cast into the sea to save the rest of the structure. A replacement lighthouse was built in 1874, and was 12.1 metres (40 ft) tall. Other additions included public baths, an aquarium, a police shed and a three-story kiosk with tea rooms. The kiosk structure also housed a family. The kiosk was wrecked in a storm in 1943, and the jetty was severely damaged by a freak cyclone in 1948. Most of the structure washed away and the remaining structure was deemed unsafe. Just two weeks later, the local council began drafting plans for a new jetty and construction was completed in 1969. The new structure was just 215 metres (705 ft) long, less than two-thirds of the length of the original jetty. The second jetty continues to stand today, at the end of Jetty Road. On 1 January 2016, two boys were drowned after falling into the water from rocks to north of the Glenelg jetty. Glenelg has been a popular spot for recreation and leisure for much of its history. 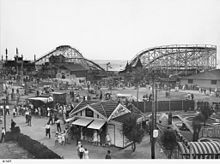 Following the success of Luna Park, Melbourne, a similar amusement park was constructed on Glenelg's foreshore in 1930. Luna Park Glenelg was placed in voluntary liquidation in 1934, and all the rides (excluding a single carousel) were disassembled, purchased by the directors, and transported to Sydney, where they were used to create Luna Park Milsons Point. The park's managers claimed that the reasons for the closure were the inability to make money from the park as it was, and opposition to changes from Council and residents, who were afraid that "undesirables" would be attracted to the area. Built near the former Luna Park site was Magic Mountain, which first opened in 1982. It featured water slides, mini-golf, bumper boats, dodgem cars and many other amusements and was popular with many Adelaide residents. It was also extensively criticised, called an eyesore and likened to a "giant dog dropping" in the media; despite this it was very popular with young children and teenagers. As part of the Holdfast Shores development, Magic Mountain was finally demolished in 2004 and replaced with The Beachouse, a 5-storey modern centre with a more conservative design which still incorporates the historic carousel; it opened in mid-2006. Since its opening, The Beachouse has been a widely popular attraction of the Glenelg area, appealing to both adults and children. A 25-metre single-arm Ferris wheel was a prominent feature of the area until its closure. Atlantic Tower was built in the late 1970s and was Adelaide's tallest residential building at the time. The fourteen-story tower featured a revolving restaurant on its top floor, and was part of a larger development plan that never eventuated. Many other high-rise buildings exist in Glenelg, including the fifteen-story Stamford Grand hotel on Moseley Square, built in 1990, and the twelve-story Liberty Towers, built in 2004. The Holdfast Shores development, starting in the late 1990s, included the construction of the Marina Pier apartment building with its own private marina in Glenelg North, and the Pier Hotel, founded 2001, and unrelated to the historic Pier Hotel on Moseley Square. The development was met with strong opposition, from both local residents and the City of Holdfast Bay, fearing overdevelopment would ruin the area. Parts of the plan were scaled back, with the Platinum Apartment building scaled down from fifteen stories to nine, and the cinema complex cancelled. 180-degree panoramic view of the Glenelg foreshore taken from mid–way along the jetty, showing some of the high–rise development. The 2011 Census by the Australian Bureau of Statistics counted 3,448 persons in Glenelg on the census night, of which 51.3% were female and 48.7% were male. The majority of residents are of Northern European descent, and almost two-thirds of residents are at least second generation Australian. 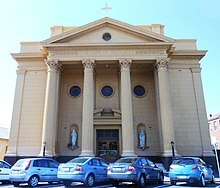 Glenelg is a predominantly Christian community, with common affiliations, in descending order, Catholic, Anglican, no religion and Uniting. The age distribution of Glenelg residents is skewed upwards more so than that of the Australian population. 26.4% of persons were 65 years or older in 2001, compared to the Australian average of 12.6%. 20.4% of persons were younger than 25 years, compared to the Australian average of 34.5%. Traffic on Jetty Road, with an H-Class and a Flexity Classic tram (2006). The suburb is bordered by Anzac Highway, (the road link to the Adelaide city centre), to the north, Brighton Road to the west and Pier Street to the south. Jetty Road is the main shopping strip in the suburb, and runs down the middle. The Adelaide Metro operates several bus services from Glenelg to various destinations including the City of Adelaide and Adelaide Airport. The local council operates a free loop bus service in the area. The only tram line still operating in Adelaide is the Glenelg Tram, which runs from Moseley Square, along Jetty Road though Glenelg, to the Adelaide Entertainment Centre, Hindmarsh. The route dates back to 1873 and is still operated on weekends and holidays by the historic H-Class trams, circa 1929. Weekday service was taken over by modern Bombardier Flexity Classic trams in 2006. Recreational boating is popular in Glenelg. To the north is the mouth of the Patawalonga River, which has been dammed to create an artificial boat harbour with a lock down to the sea. Jetty Road is a long ribbon of shops, entertainment facilities and other commercial activities - it is the main shopping precinct in Glenelg. Glenelg is the finishing point of the annual held in September. The run is 12 km long. the Bay Discovery Centre, a free museum about Glenelg's history. The annual foot race is held at Glenelg in December. 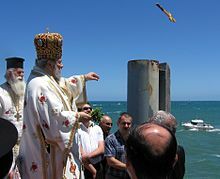 The annual celebration of the Epiphany for the Orthodox faithful of Adelaide, accompanied by the Greek festival of the Theophany. A shark museum owned and operated by conservationist and shark attack survivor Rodney Fox once operated in Glenelg. Many of its former exhibits can now be seen at the South Australian Whale Centre, Victor Harbor. House of Representatives: First preference votes. Since 1985 Glenelg has been located in the Electoral district of Morphett for the South Australian House of Assembly. It was previously in the seat of Glenelg. The current sitting member is Duncan McFetridge of the Liberal Party of Australia, who has held the seat since 2002. In the 2006 state election, the seat was second least anti-Liberal swing, with only 5.0% of the two-party preferred votes lost to the Australian Labor Party. Federally, Glenelg is in the Division of Hindmarsh and is held by Steve Georganas of the Australian Labor Party, who won it from the Liberals in the 2004 election by a margin of just 0.1%. Key issues for the area included urban development and the maintenance of heritage, aged care and health. ^ a b c Australian Bureau of Statistics (31 October 2012). "2011 Community Profiles: Glenelg (State Suburb)". 2011 Census of Population and Housing. Retrieved 30 November 2012. ^ The oldest European settlement in South Australia is at Kingscote on Kangaroo Island. ^ The Manning Index of South Australian History > Place Names of South Australia > Glenelg State Library of Siuth Australia. Retrieved 15 November 2018. ^ Allen, Yvonne; Williams G.Y. ; Ambjerg-Pedersen B.; Parnis A.; Lee J. (2001). Footprints in the sand. Kaurna life in the Holdfast Bay Area (2nd ed.). Underdale, South Australia: Aboriginal Research Unit, University of South Australia. pp. 5–6. ISBN 0-86803-918-7. ^ City of Holdfast Bay. "Heritage and History". Archived from the original on 13 November 2006. Retrieved 1 December 2006. ^ eguide Pty Ltd. "Glenelg". Adelaide eguide. Retrieved 15 December 2006. ^ "Choice of the Township of Glenelg and the new Port Section". South Australian Gazette And Colonial Register. II, (55). South Australia. 9 February 1839. p. 4. Retrieved 23 March 2017 – via National Library of Australia. ^ a b "Bay Discovery Centre". City of Holdfast Bay. 2006. Archived from the original on 23 September 2006. Retrieved 15 December 2006. ^ a b "The Glenelg Town Hall and Bay Discovery Centre". Postcards from South Australia. NWS 9 Adelaide. Archived from the original on 4 October 2006. Retrieved 15 December 2006. ^ a b Reynolds, Steve (2002). "The Glenelg Jetty". MLSSA Newsletter June 2002. Marine Life Society of South Australia, Inc. Archived from the original on 20 September 2006. Retrieved 14 December 2006. ^ "KANGAROO ISLAND". Observer. 1910-02-12. p. 43. Retrieved 2016-01-02. ^ "Glenelg Jetty Exhibit: In the Adelaide Coast region of South Australia". Postcards from South Australia. NWS 9 Adelaide. 2002. Archived from the original on 4 October 2006. Retrieved 15 December 2006. ^ Reynolds, Steve (2002). "The Glenelg Jetty (Part 2)". MLSSA Newsletter July 2002. Marine Life Society of South Australia, Inc. Archived from the original on 20 September 2006. Retrieved 15 December 2006. ^ a b "Attractions Within Holdfast". City of Holdfast Bay. Archived from the original on 8 December 2006. Retrieved 15 December 2006. ^ "Two children killed in Glenelg seaside tragedy". The Advertiser. Retrieved 2016-01-02. ^ a b c Marshall, Sam (2005). "Luna Park Glenelg - South Australia's First". Luna Park - Just for fun (2nd ed.). Sydney, Australia: Luna Park Sydney Pty Ltd. pp. 44–49. ISBN 0-646-44807-2. ^ Ashley Walsh, ABC Adelaide (2004). "Farewell Magic Mountain". Archived from the original on 4 November 2006. Retrieved 1 December 2006. ^ "Ferris wheel for Bay". The Advertiser, Adelaide. News Limited. 10 June 2007. ^ Emporis Buildings (2006). "Atlantic Tower". Retrieved 1 December 2006. ^ Emporis Buildings (2006). "Stamford Grand". Retrieved 1 December 2006. ^ City of Holdfast Bay (2004). "Profound Regret and Disappointment, Apartments to go ahead on Glenelg foreshore" (PDF). Archived from the original (PDF) on 13 November 2006. Retrieved 1 December 2006. ^ Adelaide Metro (2006). "Adelaide O-Bahn and Glenelg Tram" (PDF). Retrieved 3 December 2006. ^ Results are for the Glenelg Central booth and may not reflect the actual votes from Glenelg residents. State Electoral Office, South Australia (2006). "District of Morphett - Polling Booth Results". Retrieved 5 December 2006. ^ Results are for the Glenelg Central booth and may not reflect the actual votes from Glenelg residents. Australian Electoral Commission (2007). "Polling Place Results - Glenelg Central". Retrieved 12 May 2009. ^ Results are for the entire ward and may not reflect the actual votes from Glenelg residents. Local Government Association of South Australia (2006). "Election Results" (PDF). Archived from the original (PDF) on 30 June 2007. Retrieved 5 December 2006. ^ a b c The Poll Bludger (2006). "South Australian House of Assembly Election 2006. Morphett". Retrieved 13 December 2006. ^ Australian Broadcasting Corporation (2006). "2006 South Australian Election. Morphett Electoral profile". Retrieved 13 December 2006. ^ a b The Poll Bludger (2004). "Federal Election 2004, South Australia". Retrieved 13 December 2006.